When I heard that MBC was going to air SHINee on separate vacations in SHINee’s Wonderful Day, I did what any K-pop blogger would do: I got on Tumblr and fired off a curmudgeonly post. “SHINee, it’s not a vacation if a camera crew follows you around.” Hah! That’ll show SM Entertainment I’m not fooled by their trickery. However, when I watched the Lunar New Year Special and subsequent uncut episodes (still currently airing), the experience was completely different than I imagined. Gone was the stilted, scripted quality of many variety shows, and the boys seemed to be genuinely having a good time. It felt more “real” than any other variety I’ve watched. Could this possibly be a vacation? And if not, what is it? 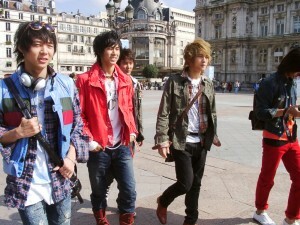 While these filmed “vacations” are not extremely common in K-pop, they are not unprecedented. Just last year Antonia wrote about T-ara’s FREEDOM Europe excursion, and 2NE1 aired their “Vacation Stories” on 2NE1 TV in 2009. If we stretch further back, there’s TVXQ’s Bonjour Paris, not to mention everything TVXQ-related that was labeled a “vacation,” but was actually a drama or variety show. First, let’s look at what a vacation is. The simplest definition is a time of rest from obligations, particularly by traveling for recreation. There is also an added sense of personal choice and privacy. Rest, no responsibility, personal choice and privacy — not things you usually associate with K-pop idols. It’s safe to say these filmings are not actual vacations, because the idols still have to work. In the case of TVXQ or T-ara, there was an accompanying photobook that they had to shoot, making their videos seem more like travel guides than vacations. Even if no other product is attached, there is a camera rolling at all times, adding pressure to look good, both physically and personality-wise. Also, if you were to tell an idol, “You get three days off,” how many of them would choose international travel over spending time with family and friends? In the reality TV, idols-on-vacation world, vacation equals travel. Actually, 2NE1’s “Vacation Stories” seems the most like an honest holiday to me, because the girls traveled to spend time with family and friends. Therefore, it’s easy to be cynical when it comes to filmed vacations. They are for promotional purposes, like SHINee’s 10-week Wonderful Day coupling nicely with their comeback. They are another way for companies to make money (hello, photobooks and DVDs). You could even think of them as a way for companies to give idols a “vacation” without actually giving them a one, which just makes everything seem all the more evil. Despite the cynicism, these filmed vacations have melted my heart, because they demonstrate all the good of recreational travel. The aimless wandering and quietness inherent in all the mentioned examples make them different from chaotic varieties or pre-prepped interviews, giving a genuine feel to the shows. While idols can’t be fully “off” in front of the camera, these vacation filmings might be the closest fans come to seeing idols let their hair down, due to the inevitabilities of travel. It’s as if through mimicking a vacation, the show becomes a pseudo-vacation, not just strictly work. SHINee’s Wonderful Day in particular emphasizes spontaneity, personal growth and rest. One of the best things about travel is spontaneity. Plans derail and change constantly, and no amount of scripting can help that. Seeing Minho frantically try to catch a train that keeps getting cancelled due to heavy rain is suspenseful, because as powerful as SM is, they cannot control the UK rail system. What if he can’t get the train and see Man Utd play?! His dreams will be crushed! While these vacations are not action-packed (and would lose their sincerity if they were), the small, unexpected moments show how idols react to change and what’s important to them, while giving viewers opportunity for empathy, since we’ve all experienced the joys and pains of travel. While on these trips, the idols’ job is to interact with a new environment, which gives us different insight into their personalities. International travel is pretty cool no matter the reason, and we see that idols can be as awed by a place or person as much as we are with them. Though T-ara’s FREEDOM viewed like a long photo shoot, it’s clear Hyomin was taken with Milan, as she constantly snapped pictures. For another example, in Paris, Yoochun pinpointed a Siberian husky in a cafe as his favorite moment, which demonstrates his personality better than a standard interview. In the case of SHINee, they interact with strangers more, and we see how they communicate with people in other countries. These interactions might be the biggest benefit for the idols themselves, as they allow for personal growth and reflection. It’s worth mentioning that SHINee’s and 2NE1’s videos seem the most like vacations probably because the members are traveling separately and therefore allowed more personal choice and random interaction. Lastly, a vacation wouldn’t be a vacation without rest. These vacations tug at one of the most basic fan desires — to see our idols happy and healthy. Idols may not be able to fully rest on these trips, but the work might be more relaxing than the usual daily schedule. (Maybe.) I nearly burst with fangirl joy seeing Onew eat good food in Thailand. This is weird, I know, but I can’t deny that if I could give SHINee — or any group for that matter — anything, it would be time to rest. Of course, I’d rather them have a real vacation, but as far as reality TV goes, I think these vacations add new insight into our idols and are surprisingly fun to watch. Readers, are you watching SHINee’s Wonderful Day? Do you have a favorite idol vacation? Better yet — which idols would you send on vacation if you could?